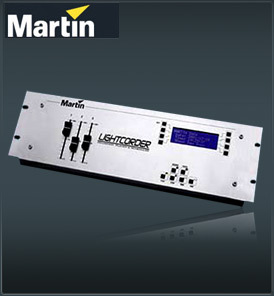 The LightCorder is an easy to operate lightshow recorder that allows you to record and playback any DMX-512 output in real time. It lets you record from 6 minutes up to a full 3 hours of DMX output. Simply connect the DMX outlet from any lighting console to the LightCorder’s DMX-in and you’re ready to go. Total recording time depends on the desired refresh rate and number of DMX channels used. (i.e., full speed refresh at 40 Hz@ 512 channels = 6 minutes; 10 Hz@ 64 channels = over 3 hours). With LightCorder you can playback a recorded light show from start to finish at the touch of a button. You can have the show loop up to 255 times or loop continuously. Playback is easily set up in the Scheduler directly on the LightCorder’s LCD display or uploaded via the RS-232 connection to any computer and then saved onto the LightCorder. A handy WindowsTM Scheduler for easy set-up and maintenance of light shows includes a complete show calendar for easy organization. The Scheduler can be used to program a light show to start at any given time or date. For added show control, three multi-purpose custom faders can operate any lighting parameter assigned to them for instant access to dimmer, intensity, color, strobe or whatever functions desired.